A very brave little girl has lost her mother. A kind, loving husband has lost his wife. Those of us who had the privilege of her friendship share their loss. So does the world of perfume. If I am writing these words now, just after learning the terrible news, it is because writing is a way of still being with her. A small, helpless, hopeless way of dealing with the loss. 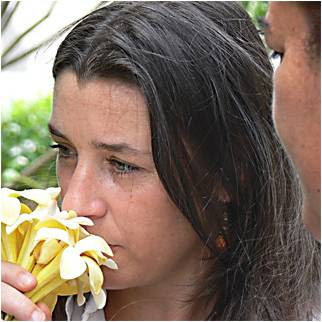 Sandrine Videault passed away peacefully in Noumea on July 3rd. She wouldn’t have wanted me to say that it was after battling a long illness. She refuted the term “battle”. During the months she lived in Paris to receive her treatment, we spoke about it many times. To her it was a journey of self-discovery, something to be lived alongside with, understood, dealt with by listening to what her body and mind were telling her. When I saw her last at a cab station in Saint-Germain-des-Prés after we’d had dinner on the eve of her return to Noumea, we said we’d Skype. I knew I might never see her again. Noumea is so far, and there was still hope -- how do you say goodbye to a friend? We never did manage to speak. 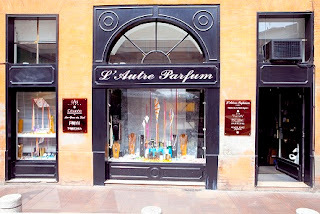 The conversation we’d been carrying out for years had come to an end, but up to that dinner in Saint-Germain, a quarter she’d long lived in, we laughed, argued, and did what we’d always done: share long, passionate discussions about the art of perfumery. Sandrine Videault was a unique perfumer, uncompromising and passionate. And she walked her talk. 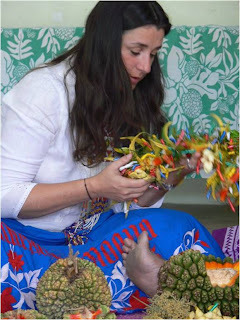 In a documentary about the making of Manoumalia, she said that when she passed away, that was one of the things she’d be most happy to have achieved. She achieved so much more, just by being who she was. The time to write about her contribution, and to consider what will have been her last composition, Magnolia Grandiflora, will come later. Now is the time to mourn this beautiful, fiery woman with her raspy laugh and her keen mind and her warmth. I still can’t figure out what life will be without sharing with Sandrine, knowing she’s out there, being sustained by her indomitable strength. On my desk, ever since she gave it to me, there is a tiny pot of Manoumalia concrete. Its fragrance is still as suave as ever. Événement "Parfums, une histoire intime" et Séville à l'aube au Bon Marché : venez nous rencontrer! Bertrand Duchaufour et moi serons présents à la librairie du Bon Marché Rive Gauche (2ème étage), pour présenter mon livre Parfums, une histoire intime et le parfum Séville à l'aube. Deux séances auront lieu, à 16h et 18h (et non 17h30 comme indiqué dans mon précédent post). Nous parlerons de notre collaboration et vous ferons sentir quelques matières premières entrant dans la composition du parfum.